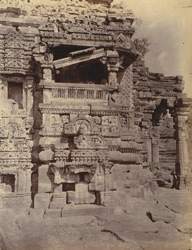 Photograph of the base of the Mala De Jain Temple showing sculptures on walls and porches at Gyaraspur in Bhopal State, taken by Joseph David Belgar in c. 1871-72 as part of the Archaeological Survey of India Collections: Indian Museum Series (Duplicates). The Maladevi temple dates to the 9th Century and is an example of the mature Pratihara style. The temple, which is partly structural and partly rock-cut, is situated on the slope of a hill and is composed of a sanctum with ambulatory passageway, a mandapa and a porch. Entered through a porch standing on four profusely ornamented pillars, the temple is covered by a lofty curvilinear tower of seven storeys decorated by meshes of arch-like motifs. These rise on a square moulded basement with niches on the four sides and have a ghatapallava or pot and foliage base and capital and an octagonal fluted shaft with chain-and-bell carvings. The temple was originally dedicated to a Hindu deity although Jain figures have now been placed inside.